Fresh Angeles: Disney's BOLT at El Capitan Theatre = Fully Awesome! Disney's BOLT at El Capitan Theatre = Fully Awesome! We got to go somewhere very special this past week! "BOLT" at Hollywood's legendary El Capitan Theatre! I know a very brave thing to do with a 14 month old, right? Well it started off with a pre-show. But not just any ol' show, Disney's Holiday Spectacular to be exact! 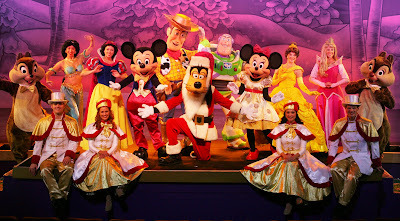 Starring Mickey, Minnie, the Princesses, Woody, Buzzlight Year and a very Goofy Santa Claus! It was very festive! It really got me in the holiday mood! And there was one really big surprise: SPOILER ALERT!!!!! Then as if that wasn't enough excitement.... We still had a movie to watch! Which by the way was GREAT!! I'm sure you know the story. A dog who is an actor who think he has all of these super-powers. But in reality he does not. He gets lost from him "human" and he has to find his way back minus the powers. He makes some friends along the way that help him on his long journey home. There was also a twist.... The movie is shown in 3-D. Yep, you get the 3D Glasses at the door. Granted Kaia wouldn't keep them on, so I didn't wear them either. But either way it looked very cool! This would be a great show to take the family to over the long Thanksgiving weekend, or even during Christmas break! You have a limited time as it leaves the El Capitan Theatre on January 4, 2009. Daily Showtimes are 10am, 1pm, 4pm, 7pm & 9:55pm. Get your tickets at the El Capitan Online. You could also call 1-800-DISNEY6 for more info. *A special thank you to Scott for helping to make it a magical day for everyone! Excellent movie! You are so right, we loved it!